Constructed by four layers of cabinets,4 frames below 25"x21"(64x53) can be held at the same time, saving time, improving efficiency. Inner and out sides all adopts electrostatic spraying, professional outlook, easy to clean and no rust.It is wholly coated without corrosion and dandification. The drawer type is flexible but perfect tight. All kinds of screens can be placed and moved flatly with printed side up to guarantee the adhesive layer smooth. Voltage 110V Power 800W Plug standard US, Canada Machine size 27.9"x24"x12.2" (71x61x31cm) Packing Size 32.6"x27.9"x15.7" (83x71x40cm) Net weight 80Lb (36kg) Shipping weight 88Lb (40kg)* Max screen frame size : 25"x21"(64x53cm). * The top layer need to put in the screen frame in vertical direction. 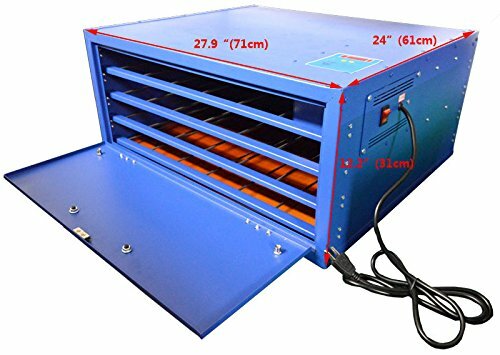 The inside installed axial flow fan makes the hot air in circulation, which guarantees an equal temp in cabinet and can improve drying efficiency meanwhile. The axial flow fan (specially used for large computer equipment) can normally be used for about 20,000 hours. It usually takes 2-4 minutes to well dry the screens coated with the photosensitive emulsion. It adopts hierarchical (100 levels) temp-adjusting system; users can adjust temp according to ambient temperature and different materials. It can operate according to your set temp next time because of its automatic memorizing function. It is wholly coated without corrosion and dandification. The drawer type is flexible but perfect tight. All kinds of screens can be placed and moved flatly with printed side up to guarantee the adhesive layer smooth. The heating plates are adopted the newest blade and unit type, with double-heat, low power and high heat efficiency. At the same time, it guarantees the temperature of machine even to make the temperature of each floor even and accurate.